A question that comes up from time to time when chatting about aerodynamics stuff is how much impact does another rider in close proximity have on your aerodynamics, or more correctly stated, does having another rider in close proximity change the power required for you to maintain your speed? We are all familiar with the reduction in power required when riding behind another rider. This "drafting" benefit is substantial and anyone with a power meter can see the big reduction in power when they move from riding directly into the wind to riding behind another rider. Even if you don't have a power meter the difference is certainly large enough to notice the reduction in effort required. But what about when your buddy is drafting behind you or rides beside you? Does this impact the power needed to maintain the same speed? The short answer is: yes, both of them do. But in what way and by how much? The question as to whether a rider in front gains benefit from having a rider behind them has been researched before, and the consensus is that yes, they gain a small benefit. There is good reason for this slightly counter intuitive result and it's to do with the "bow wave" of air from the rider behind causing a change in the turbulent air flow behind the lead rider and reducing, by a small amount, the depth of the low pressure zone that exists behind the front rider. This slight reduction in the fore to aft air pressure differential of the lead rider provides a small but measurable gain. This can be expressed as a reduction in apparent CdA, but since a rider's CdA doesn't really change if their position and equipment hasn't, then in reality it's a change in the forces acting on the rider, and as a result, the power demand at the same speed is slightly reduced when compared with having no rider in close proximity (or alternatively, a rider can travel slightly faster for the same power when they have a rider immediately behind them). "having a rider drafting closely behind them apparently lowered their CdA by 3.2%, i.e., from 0.198 to 0.192 m^2.". The reduction in energy demand will be of a very similar amount to the reduction in apparent CdA. Assuming ~350W, a reduction from a CdA of 0.198 to 0.192 is equivalent to a reduction in power demand at the same speed of ~10W, or 2.8%. In this case the other rider was riding in pursuit set up, and were themselves very "aero" (an elite track pursuit rider). Racing cyclist power requirements in the 4000-m individual and team pursuits, Medicine and Science in Sports and Exercise, v31, no.11, pp 1677-1685, 1999. J.P. Broker, C.R. Kyle and E.R. Burke. where amongst their data they report that the lead rider requires 2-3% less power while riding on the front of a 4-man team than if riding solo at the same speed. In this paper they report the lead rider of two riders riding in single file receives a reduction in energy demand of 2.6% while riding in the time trial position. 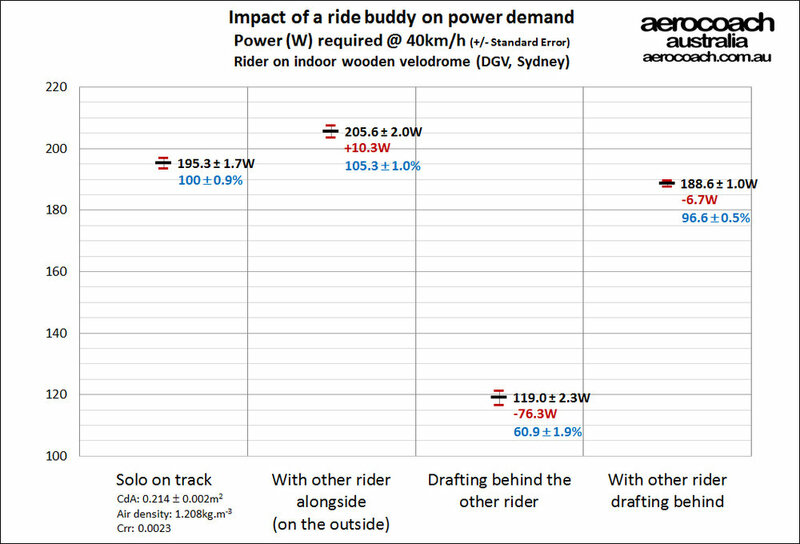 Above are three examples of data from a similar situation, with reported reductions in energy (power) demand to ride at the same speed ranging between 2% to 3% for the lead rider compared with riding solo. Edit: I've now read the paper and it used two dimensional CFD analysis on ellipses as a simple model simulation of multiple riders in a line and is indicative of the principles involved. I've had the resources to test this for some time but I've hadn't got around to doing the experiment, mainly because exclusive use of track time costs money and I'm focussed on working with clients on answering more important aerodynamics questions for them than doing experiments just for the fun of it. But today I had the opportunity to do just such an experiment. I was doing aerodynamics testing as part of a story being written about a woman masters rider preparing for the UCI World Masters track cycling championships being held in Manchester later this year. Cycling NSW kindly offered and arranged for the track time to make this possible, and a client of mine, Rod Wagner, loaned a special power meter to enable the testing on the rider's track bike, while I offered my time for the aero work. We'd reached the end of our allotted track time, but as luck would have it no one else was ready to ride on the track, so we had some spare time for the experiment, and willing participants. I won't comment on the primary aero testing session as that's for another to write about for later publication in magazine and online, but I'll expand on the impromptu experiment. With the Alphamantis Track Aero System, I record and monitor in real time a rider's aerodynamics as they circulate around the indoor velodrome. Testing is done indoors as this removes the wind variable and provides for a well controlled environment. The system enables us to monitor speed and velocity and along with other key inputs such as air density, track geometry data, centre of mass height, rider mass and rolling resistance variables, the Coefficient of drag x Frontal area (CdA) is also plotted in real time and lap by lap a picture of a rider's aerodynamics is revealed. I've briefly explained this system before in this post, which also has a video demo. You can also read more on the Alphamantis site linked above. drop off entirely and stop riding, so that we could obtain data from the test rider circulating solo. This test process was repeated a second time during the long test run to validate the results from the first run. For reference, the test rider is a slim 60kg female approximately 172cm tall, and the coach weighs approximately 80kg and is ~185cm tall. The test rider was using a track bike with pursuit bars, while the other rider was using a track bike in regular mass start set up. The system is really reporting the impact on apparent CdA. It's a quick way to measure how beneficial or detrimental having the other rider near you is, and the measurements are not overly sensitive to the changes in speed during the run (this is the nice thing about the process). Here's a table summarising the results of all the data runs. Click on images to see larger versions. In the case of the support rider riding behind the test rider, the test rider gained a benefit of a reduction in apparent CdA of around 0.008m^2, or about 3.8%. Note (i) the error range and (ii) the support rider was riding in a more upright mass start position (and consequently has a larger "bow wave") and is somewhat larger than the test rider. Also shown are the results of the traditional drafting, being a reduction in apparent CdA to nearly half of the solo value, and interestingly, the apparent CdA increase of ~ 0.013m^2, or nearly 6% when the other rider was riding alongside the test rider. Compared with riding solo, the test rider gains a ~7W (3%) benefit from having her ride buddy directly behind her; a 76W (39%) benefit from drafting behind her ride buddy; and a 10W (5%) penalty when her ride buddy is riding alongside. So in this experiment, I found a 3% energy demand benefit from having a trailing rider, and that's right in line with (but at the top of) the range found by the other reported data referenced earlier. This result of a 10W penalty when riding alongside another rider is more novel, although it doesn't surprise me it may be news to some. It is something to ponder when riding in team formation events, especially when the lead rider pulls aside to make their way to the back of the line of riders. They and their team are better off (at least in low yaw conditions) if the rider pulls over and moves well away from their companions until they are near the back and can return to be in the draft of the other riders. 10W is nothing to sneeze at. So it would seem that if you wish to ride alongside your ride buddy, it might cost you ~10W give or take. If speed is of the essence, then ride in single file, you'll both go quicker that way.